Most first-time parents have no idea what to expect when they are waiting for their baby to be born. 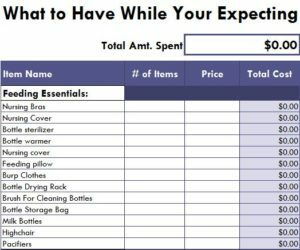 This template gives you a helpful list that you can use to buy the things that will make your life so much easier when the baby arrives. The free Items to Have While You’re Expecting also acts as a functional calculator that you can use to tally up the amount it will cost you for all the items on the list. However, we highly recommend you put these items on your baby shower registry and have your friends and family buy them for you. To get started, you will need to follow the list of directions at the bottom of this page. You can download the free template document by clicking the link below. The first column of the template shows you exactly what you need as a first time parent to make things easier. The template is broken into different categories and separated by a purple line. There are sections for essentials, clothing, diapers, bed/bath, and more. Start at the top and go through the things you will need. You’ll typically want all the things in the essentials category, but you can do without things like “Bottle Storage Bags,” for example, they just make your carrying things easier for you. You can browse these items on retails store’s websites or on Amazon. As you enter the prices of items you want into the template, the calculator will show you the running total for all the things you want to buy. If you scroll to the very bottom of the template, you will see this total; there is a section at the top that shows the total as well. Use this template to get the things you and your new baby need today!